After several years in the country, Australia’s ‘warts and all’ style of politics still intrigues me. The headlines of the Julia Gillard vs Kevin Rudd tussle to lead the Australian Labor Party and the aggressive campaigning ahead of the 2013 federal election that featured some outrageous allegations about both sides have been part of my Australian experience. So, when an opportunity came to visit Parliament House, I was keen to see the politicians in action. Before you get anywhere, there are high levels of airport-style security screening, which you have to complete before entering the building, and again if you wish to enter the two chambers: the House of Representatives and the Senate. 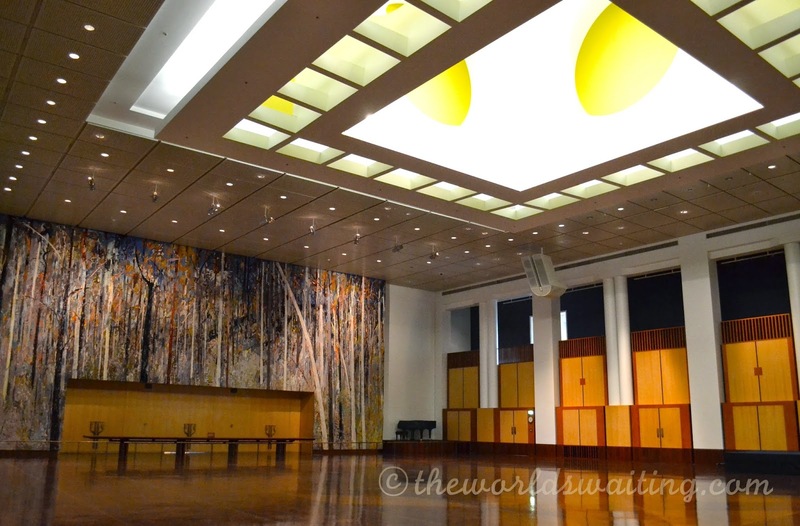 Built in 1988, Australia’s Parliament building has a distinctly modern feel. The public is only permitted access to limited areas, leaving the politicians to get between their offices and the chambers uninterrupted. The main foyer is a marble wonderland, with grand staircases, pillars and decorative elements, all created with marble. The Great Hall is also on this floor and worth a quick look. A beautiful tapestry of a New South Wales forest covers an entire wall. The design is a nod to the vast land parliament governs. There is an elevator to the roof of the building, from where visitors can enjoy the elevated lawn and admire the view over Canberra from the base of the iconic 81 metre flag pole. On the first floor the walls are lined with portraits of previous politicians and numerous displays of apology documents addressed to Aboriginal communities and others affected by misguided policy. There is also a copy of the Magna Carta. Question Time takes place from 2pm to 3pm on sitting days. It is a lively debate between the members of parliament, where members can address, often impertinent, questions to the sitting leadership party. The public is able to view proceedings from an open gallery above the House of Representatives, but is requested to be silent throughout and not disrupt proceedings, under threat of removal. Having checked our belongings into the cloakroom and undergone the second round of security checks, we settled quietly into our seats above the House of Representatives. A lad further along the row was leaning his crossed arms on the barrier in front of us and was asked by a security guard to sit up properly. Whatever the politicians get up to, the audience is expected to be on their best bahaviour! The ‘pollies’ as they are known in Australia, started to arrive in the chamber and chatted casually as they found their seats. Prime Minister Tony Abbott entered, with an arrogant stride. He almost looked like he was wading. With everything going on at the moment (Oct 2014), perhaps that’s how he felt. The Prime Minister and his Liberal Party colleagues fielded questions from the house, primarily queries about some rather draconian new national security legislation and the recent budget. The debate was heated and it was as much as the speaker could do to discipline one mischievous member before she got the next one’s name out of her mouth. At one point, Previous Deputy Prime Minister Wayne Swan was ejected from the chamber after refusing to retract his statement that Treasurer Joe Hockey was a liar. So, although they often seem like an unruly mob on television, there is some discipline, sort of. 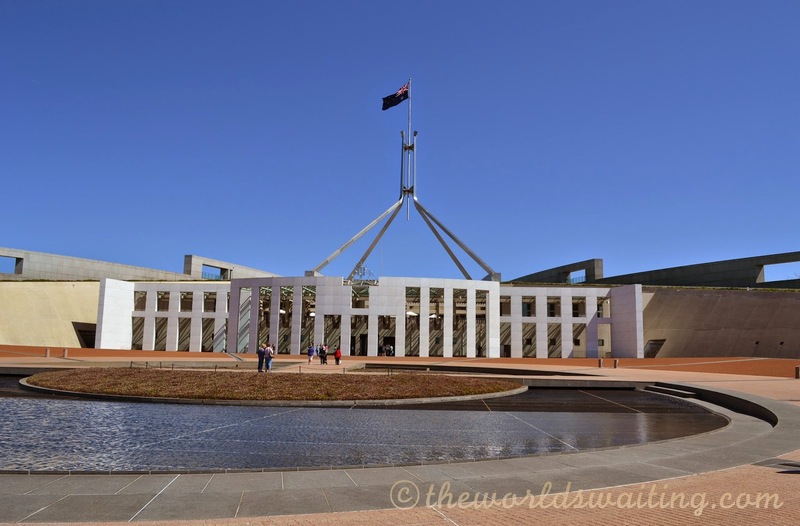 The House of Representatives is a vast chamber that feels hidden away from the world, perhaps because of all the security measures, and technically being underground (Parliament House is built into a hill). Even though the media are very visibly there and broadcasting snippets of what is happening, it is exciting to be in there with the decision-makers. A controversial decision made the day I visited Parliament was the ruling that any visitors to Parliament House wearing clothing covering their face, such as burqas or niqabs, would be requested to sit in a separate gallery behind sound-proof glass, an area usually allocated to school children. That certainly got the media talking. Just another day in politics, people!